The standard metal plate wallet consists of one or more metal plates plus an elastic band to hold the metal plate(s) and the wallet content together. 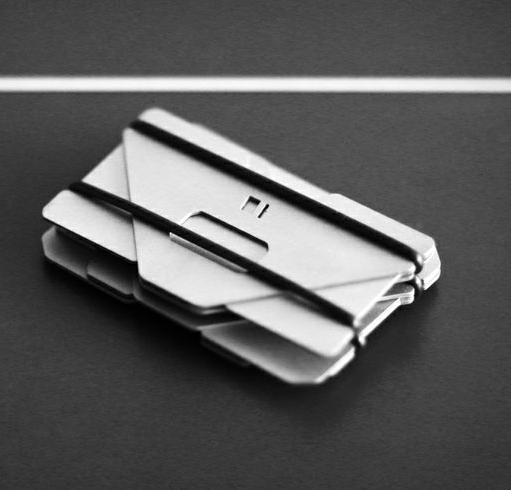 The Obstructures A3 Aluminum Plate Wallet looks very much like the standard metal plate wallet design. It has 3 metal plates and these are held together by not one but 2 elastic o-ring bands. However, due to its unique design, the way the Obstructures A3 Aluminum Plate Wallet functions is very different from the standard metal plate wallet. The Obstructures A3 Aluminum Plate Wallet has 3 plates made from aluminum and each plate has a unique design. There are 2 bigger sized rectangular plates and a smaller triangular plate. If you take a closer look at bigger plates, they have tabs arranged in an offset similar to the divider tabs in a document folder. The tabs allow you to pry the wallet open to access the storage space in between the aluminum plates, again just like a document folder. The Obstructures A3 Aluminum Plate Wallet uses 2 elastic bands. The lower band holds the bottom of the wallet together letting it function like a hinge when you open up the wallet. The upper band holds the wallet close and when the wallet is opened, it rolls down to the bottom. To securely close the wallet, you roll the top band back up again. If all of this sounds confusing, just refer to the video below. We have to admit that in real life or at least with the Obstructures A3 Aluminum Plate Wallet that we got, opening the wallet is not as easy and as smooth as it looks in the video. It took quite a lot of practice before we got half as good. We suspect that the elastic o-rings on our wallet have higher tension than the ones in the video. As the bands got stretched out more, it became easier to pry open the plates. Once you get the hang of it, accessing the content is easier and way cooler than your usual plate wallet. It is also worth noting that you can replace the bands with your own to adjust the tension. The wallet uses Soft Buna-nitrile o-rings that are easily available. In case you are wondering about the smaller triangular metal plate, there is a good reason for that. Cash is tucked behind the smaller plate which makes it easier to access as you just slide it out instead of opening the compartment. If you are not carrying cash, you can store your most often used card behind the triangular plate. Last but not least, the triangular plate actually has a built-in bottle cap opener. Like most metal plate wallets, the Obstructures A3 Aluminum Plate Wallet does have RFID protection simply because of the use of aluminum plates that block the signals. For best protection, place your RFID cards between the larger rectangular plates. The Obstructures A3 Aluminum Plate Wallet can easily hold 8-10 cards plus some cash. As with any metal plate wallet with elastic band design, there isn’t any real limit. The wallet can also be customized by removing one or two of the plates for a more compact design. Alternatively, it can be purchased as a 2 plate design with just just one large plate and the small triangular plate. The Obstructures A3 Aluminum Plate Wallet is a super compact wallet just large enough for typical credit cards and cash with a unique opening feature.